BT Young Scientist & Technology Exhibition: In the first week of January each year, Calmast and the their partners TEVA, Bausch and Lomb and Waterford Council get the opportunity to show the best of the southeast at the BT Young Scientist and Technology Exhibition to the 60,000 visitors but Calmast, Waterford Institute of Technologys STEM outreach centre is working throughout the year with students, teachers and the public. Here are a few highlights of the year. Waterford Engineering Week, which takes place during February, is designed to engage over 2,000 Waterford Region primary, secondary and tertiary learners and the otherwise curious about the various opportunities available through engineering. This is done through talks, workshops and quizzes where engineers are on hand to enlighten interested students. [email protected], April: This one day competition welcomes students from all secondary schools in the region to compete in a one day competition. Students compete in categories such as Life Science, Physical Science and Technology while being judged by figures from local industry and staff at Waterford Institute of Technology. Bealtaine Living Earth Festival May: This Festival engages young people and the general public with talks, walks, shows and much more. The Festival continued to grow in 2015 and attendance was over 1,500 across all events. Lecturers from WIT lead many walks, talks and workshops for schools and the public.As well as the annual International Day for Biological Diversity, Bealtaine Festival of Outdoor Science incorporates Fascination of Plants day which helps promote the importance of plants and plant products in everyday life. As part of this, several plant eco-tours and a botanical drawing session are held. Summer Camps and Teacher Training: Calmast’s Discover STEM Secondary Summer Camp was fully subscribed in 2015. 40 teenagers were introduced to the variety, wonder and fun of science, technology, engineering and maths activities by WIT staff and researchers. The secondary summer camp also helps in the demystification of the third level institute, work in third level laboratories and allows students to begin the decision making process of approaching science or engineering at third level. GET SET for Summer Primary Camp was bigger than ever this year too. With over 40 young people in attendance in July students were able to engage with science games, experiments and much more. The main aim of the primary camp is to stimulate interest in science subjects from an early age and to relate unfamiliar subject matter to everyday life. In 2015 Calmast ran the Primary School Teacher’s training course where 25 teachers from throughout the region got hands-on with theory and experiments from a variety of sciences and technologies. The Robert Boyle Summer School. One of the highlights of the year was the 4th Annual Robert Boyle Summer School which took place during the last weekend of June in the scenic heritage town of Lismore. There was an extensive programme in place for the Summer School, exploring the history of Boyle as well as his legacy. The summer school is aimed at members of the public with an interest in science, local history and heritage. The theme of 2015’s summer school was “Scientific Publications”. In 2016, the Robert Boyle Summer School will take place from June 23rd to 26th and will explore the area of Science and Irish identity in light of the upcoming 2016 commemorations. Spraoi & sprÓg: In 2015 Calmast significantly expanded their impact with Spraoi & sprÓg. Science themed street theatre, mini science activity hubs, science mobile karts, were all central parts of Spraoi in 2015 at the August festival. Calmast are one of the main creative partners of sprÓg, the children’s festival which takes place in the week leading up to the Spraoi weekend. In 2015 Calmast offered live shows (themed around the human body and FUNdamentals of Science), workshops and much more. 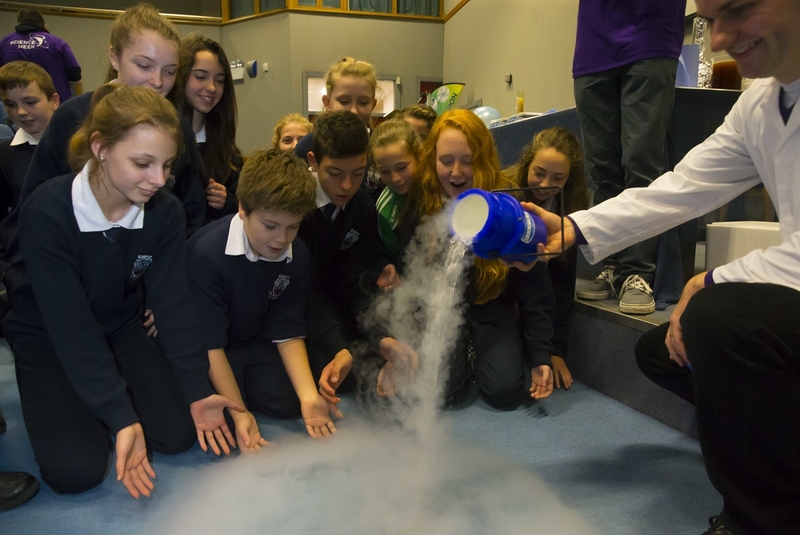 The Robert Boyle Science Festival is the Southeast’s offering for national Science Week in November The 2015 Science Week was the 20th annual celebration of all things science. Staff and students from WIT provided workshops on DNA, colour chemistry, and more, as well as talks on cloning, human health, cancer. A central art exhibition STEAMdream EnLIGHTenment took place during the week.